Knight is breathing new life into a tired subgenre. What I like about “Left With The Dead” and “The Gathering Dead,” is that there aren’t any stupid characters doing stupid things, where the reader is hoping beyond hope that the zombies get them sooner rather than later. 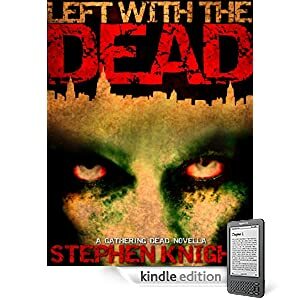 The characters here are well drawn, intelligent, and doing whatever they can to survive the hordes of the dead. Knight’s writing is clean, meticulously crafted, and he knows how to write combat sequences. The ever increasing tension throughout had me hoping beyond hope that the characters would make it to the end of the book. There are instances when I cringed, and not because of a character’s predictable or bad decision, but because the characters herein are making all the *right* decisions, and *still* defecation impacts the rotary oscillator. I can’t say anything more about this particular novella except, if you enjoyed the first Gathering Dead book, then this is an addition that raises an already high bar. And for the price, you’re robbing the walking dead.